RS004 | Joseph Rothschild (b. 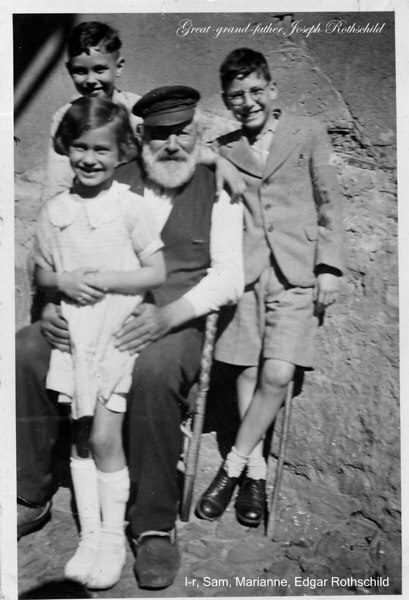 01 Jan 1850; d. 1942 or 43 in Amsterdam, killed by Nazis) with great-grandchildren, Sam Adler (top left) Edgar Rothschild (right), Marianne Adler on lap; circa 1934. There were, apparently, more "Rothschilds" in Hoerstein than just Joseph and his clan. For instance, we read in an article in the newspaper, "The Israelite," of 3 Juli 1924: "Hörstein bei Aschaffenburg, 1. Juli (1924): Das Ehepaar David Oppenheimer und Frau Esther geborene Rothschild feierten am Samstag, den 21. Juni, in körperlicher und geistiger Frische im Kreise ihrer Kinder und Enkel das Fest der Goldenen Hochzeit." [the married couple, David Oppenheimer and Mrs. Esther nee Rothschild, celebrate on Saturday, the 21 of June, in the physical and spiritual company of their children and grandchildern, their Golden Wedding Anniversary]. Based on another article in the same paper, Esther celebrated her 80th birthday in 1933, meaning she was born in 1853, perhaps a younger sister of Joseph. More research is required. Yad Vashem lists yet an other "Joseph/Josef" Rothschild born in 1891.